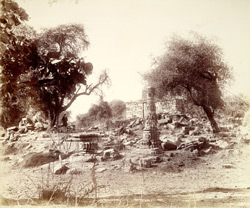 Photograph of the ruins and a standing pillar at Chandravati in Gujarat, taken by Henry Cousens in the 1880s, from the Archaeological Survey of India Collections. The plan of the ruined temple at Chandravati is reminiscent of the Govindesvara temple at Sinnar. It dates from the14th century when the Paramara chiefs of Abu ruled Chandravati. The Hindu temple, constructed of white marble, was originally centred amidst five smaller shrines; however, only three of the surrounding shrines remain. In the 'Archaeological Survey of Western India', IX, 1903, Burgess and Cousens reported: "Save portions of the basement of one temple, and a few blocks of the back wall of another, nothing now remains of the beautiful shrines discovered in 1822, excepting one solitary column which, by its loneliness, accentuates the desolation around it. A short walk from this reveals one of the chief causes of this; for there, under the railway bridge, on each side of the stone piers, in the river bed, lie in heaps upwards of a hundred cart-loads of sculptured fragments and images, - the unused portions of the vast amount of marble carried off from these temples. It has been used wholesale on the railway, to build the piers of the neighbouring bridges and culverts and to break up for metalling the permanent way. Nor is this at all a solitary instance of such wanton destruction by railway contractors and others: it has been only too common."